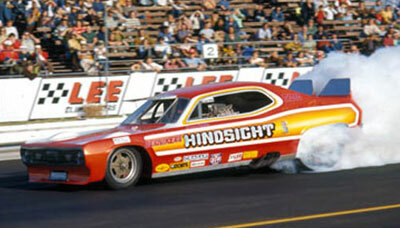 If the high point in the all-too-short lifespan of the rear-engine Funny Car was Jim Dunn’s victory at the 1972 Supernationals, surely the low point was Dennis Geisler’s jaw-dropping backflip with Burt Berniker’s Hindsight Duster during qualifying at the 1975 Winternationals. Because the appearance of any rear-engine car was always a treat for the photographers, all eyes were trained on Geisler at the Winternationals, so his crash was famously captured by many, including National DRAGSTER Photo Editor Leslie Lovett, who shot the sequence at right, and veteran journalist Woody Hatten, who caught the crash on film, which you can see below. You gotta love Lovett’s sequence for a number of reasons, but I especially dig seeing the inner workings of the car as the body comes off, beginning with the third frame (be sure to use the “larger image” tool in the gallery). In frame four, you can see the entire engine and its relationship to Geisler, the protecting tinwork behind his head, and the fire extinguisher mounted on the outside of the cockpit tin. In frame five, you can see more of the running gear and how the parachute was attached, and in frame six, you can see how close Geisler’s feet were to the front axle and the fuel tank. The car was heavily damaged in the crash and never rebuilt, ending the saga of a car that Geisler once told me he thought was just on the verge of getting good. I interviewed Geisler in 1997 and dug up those notes for this article and was pleasantly surprised to hear from Mark Johnson, who headed up oil-pan operations at Milodon and was part of the Hindsight effort from its earliest stages, so let’s go back to the beginning before we get to the end. Richard Ruth at his Competition Engineering shop in Sun Valley, Calif., built the chassis. 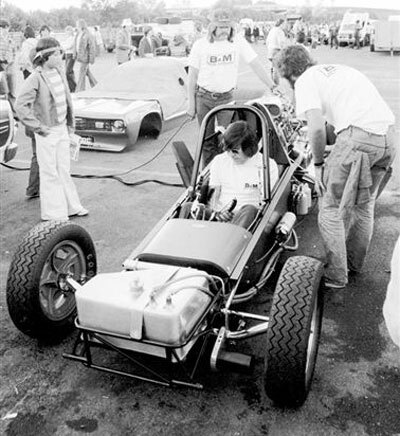 The body began life as a standard J&E Duster that then was stretched and tweaked to fit the car by Joel Petersen. Jim Hume at H&H Race Craft did the tin, and Johnson welded up the mods to the fuel tank. (Johnson is also the graffiti artist who did the temporary lettering in the photo of the unpainted Hindsight shown here that actually kicked off this whole thread.) The engine was a typical Keith Black aluminum block stroker. Berniker’s introduction to the sport actually came through Petersen, whose son was school buddies with Berniker’s son. According to Johnson, Berniker was the engineering/manufacturing genius behind Rodac Air Tools, which was owned by his cousins. Jim Adolph tries out the cockpit; Don Baumunk is by his side; Adolph's brother, Pook, stands ready at the engine to light it. 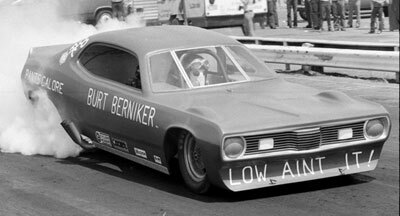 Don Baumunk was the original driver and got the car over 200 mph before he stepped out of the driver's seat. "The first full launch was rather dramatic," remembers Johnson. "An immediate right turn from the left lane. It was so immediate that the car seemed to be tipping over on its left side. I remember being shocked that Don was able to catch it so quickly that it never even scraped the headers but it sure got everyone's attention. Larry Dixon thought about it for a couple of minutes then recommended an adjustment to the left side torsion bar splines. That was the only chassis adjustment ever made that I know of." Just prior to that fateful Winternationals, the team had tested at nearby Irwindale Raceway and chalked up a 6.80 pass and headed to Pomona with that combination in the car. Geisler was first to the starting line in the opening session, and then all hell broke loose, as seen in Hatten's clip below. "The track was good, and the engine was running a little better than we thought,” said Geisler. “It just hooked up too good. With those cars, your eye level was on the hood, so when the car left the starting line with the front end up, you'd lose your horizon, even if it was only 6 or 8 inches up, and you'd have to look off to the side to see where you were. That's what happened on that run. By the time I realized it wasn't coming back, it was already up to a 45-degree angle." Added Johnson, “Because we were first, nobody knew what the track was like. Wheelie bars were kinda optional at the time, and we had never seen any indication that we needed them. Of course, the track was phenomenal, and over it went. This, of course, sent everybody in line scrambling to take out clutch. I believe the next up was Leroy Chadderton, and he went into a wheelstand right away, but, being forewarned, he caught it quickly. The rest of the field did fine once they knew what to expect. According to Johnson, Berniker died in the late 1970s. “Bert led a very high-pressure life, including cigarettes, coffee, and job stress,” he said. “He died of a heart attack too soon; near as we can figure." Reports that Berniker himself had driven the car were inaccurate. Losing the car was tough for Geisler, who felt that the bugs had finally been worked out of it just before the wreck. "The car charged real hard and generally went straight," he said. "We mostly match raced it, and we were competitive — we were a little slower than the good guys — but not good enough to win any meets. We were just getting good when we ran Pomona." Whether or not that’s wishful thinking, I can’t help but wonder about what would have happened if he had been right. With today’s technological advances and better chassis designs, could one work today? I don’t know the answer, but I did propose the question to nitro genius Austin Coil about 15 years ago. "Difficult, very difficult," was Coil's assessment of the problems of building a rear-engine car for today's competition. "Not that I haven't given it a lot of thought, though." For those who think it's as simple as shoving a Top Fuel-type combination under a Funny Car body, think again. Today’s rear tires are 4 inches wider than they were in the early to mid-1970s, and with better clutches, more power, and better track prep, it might be a recipe for disaster. "The front end would be about 200 inches too short," Coil laughed. "It would flip overbackwards before it reached the Christmas Tree. I'll see you next week with more rear-engine madness. I've received quite a few interesting photos and info from the Insider Nation that will keep this thread going for a while; maybe it even will rival the ramp-truck and wedge-dragster threads!